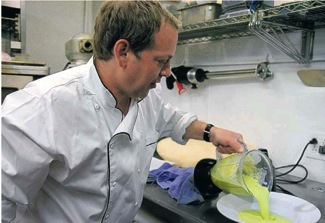 Matt Yohalem of Il Piatto cooks Asparagus Bisque. View the rest of the videos here. Home cooks might be surprised how much they have in common with classically trained chef and restaurant owner Matt Yohalem of Il Piatto in Santa Fe. 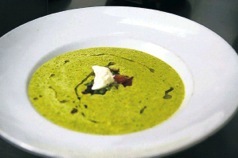 Asparagus bisque features super-fresh asparagus from Santa Fe Farmers’ Market. While your kitchen probably doesn’t have a warm and ready beurre blanc sauce or a waiting pot of steaming court bouillon for blanching asparagus, what it might have in common with Yohalem is access to fresh vegetables from local farmers, regularsize refrigerators (no walk-in here), pots, pans, a blender, fire and knives. And that seems to be nearly all Yohalem needs to bring his magical Italian Farmhouse Kitchen cuisine to life. Of course some culinary training and a few years of experience don’t hurt, and Yohalem’s time cooking alongside some of the finest chefs and restaurateurs in New York, France, New Orleans and beyond have provided a delicious foundation for his take on regional Italian cuisine. Knowing this, it only makes sense that my morning with Yohalem starts with a trip to the Santa Fe Farmers’ Market. “The market is a natural place to buy produce. Does it get any fresher than that?” he asks playfully while snapping a stalk of his just purchased asparagus. Chef Matt Yohalem of Il Piatto in Santa Fe starts his mornings with a trip to the Santa Fe Farmers’ Market. “The market is a natural place to buy produce. Does it get any fresher than that?” he asks playfully while snapping a stalk of his just-purchased asparagus. Yohalem’s caffeinated cascade of enthusiasm for fresh, regional food is contagious. Some of Il Piatto’s most popular menu items now include chile. And would anyone say the red chile linguine with mussels and saffron cream or the four cheese gnocchi with green chile and three colors of cauliflower are not Italian? Cooking with locally grown food often requires you do the shopping first and the menu writing second. April, May and June are prime time for asparagus here, but depending on weather and where your favorite farmers lives (cooler is better), it can be found up until about the 4th of July. When buying, look for asparagus that are bright green with no signs of shriveling. The tips should be firm and tight. Local asparagus may be bent if it has been windy, and don’t worry if it’s not all uniform in size. Thin or thick is a matter of personal taste: thin spears are more tender and sweet, while fatter stems have a meatier texture and stronger asparagus flavor. 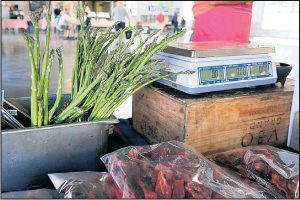 A number of varieties are grown in New Mexico, and purple asparagus is usually tenderer and has higher sugar content, making it sweeter and perfect for eating raw in salads. You can store asparagus in a produce bag in the vegetable bin but it is more likely to get broken or forgotten there. The best way to keep asparagus is to trim the cut ends, stand them in a glass of water, cover with plastic, and refrigerate (glass and all) for up to two days. However you choose to prepare them, asparagus is done when it’s tender and still has a slight bite to it. Undercooked asparagus will be difficult to chew and overcooked asparagus will taste mushy. You can pierce the spears with a fork to gauge how cooked they are, but I prefer to just bite into one. 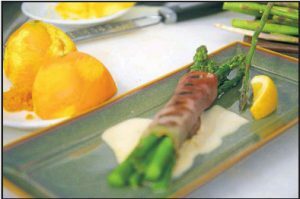 If you’re like Chef Yohalem, you’ll enjoy turning one or two bunches of asparagus into two amazing dishes — grilled prosciutto-wrapped asparagus and asparagus bisque. This kind of kitchen multitasking is a brilliant use of resources because the trimmed asparagus bottoms from the prosciutto wraps are just what the soup requires. Here again, home cooks may find themselves in concert with classically trained chefs: not wasting ingredients is always the goal. Yohalem readies the asparagus before blanching for the grilled prosciutto wrapped asparagus by tying a bundle together with kitchen string. String is better than a rubber band, he explains, because the asparagus will expand in the water. It also makes them easier to pull out of the pot before submerging them in an ice bath to preserve their gorgeous color. As Yohalem tends to his soup, several tips whiz by: 1) white wine is cooked out as it would break down the cream; 2) when blending hot soup, initially pulsing it releases the heat and keeps it from erupting; and 3) parsley could be used instead of arugula, but good, fresh asparagus will benefit from the piquant arugula. Yohalem is a whirlwind in the kitchen and like any master of his craft, he makes it all look simple. The keys to cooking, he says, are to develop a few techniques that empower you and to taste everything. Now how hard can that be? Special thanks to our partners at Edible Santa Fe.